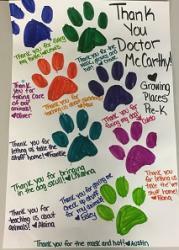 Recently, I was fortunate enough to have Growing Places (an early education center) invite me to talk to the pre-K classroom about being a veterinarian. The children were learning about being community helpers and had a large box filled with donations to bring to the local shelter. This adorable group of kids were so excited, and they all brought a stuffed animal for a check up! I had so much fun explaining to them all the animals veterinarians can take care of, what a veterinarian does-from check ups to surgery, and how to be safe around animals. We then had a blast bandaging, doing exams, and surgery on the stuffed animals. The kids each got to take home their own stethoscope. What an awesome experience!